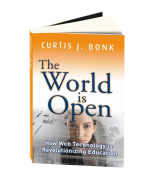 We welcome Curt Bonk from Indiana University for this live discussion about his new book: The World is Open: How Web Technology is Revolutionizing Education. Information about the book can be found on the blog, including a link to an upcoming free "book extension". The format for the session is a World is Open Q&A. We are using this forum to gather questions from YOU to ask Curt on December 21st.